I’m super excited about welcoming in spring and summer. I look forward to the warmer weather ahead, trips to the farmer’s market and weekends up at the lake. This is truly my favorite time of the year. The days are longer, I have more energy and I wake up happy and ready to start my day. . .even on Mondays. Crazy, right? 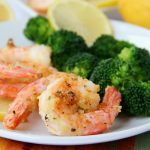 In the warmer months my cravings change from comfort foods to fresh foods. 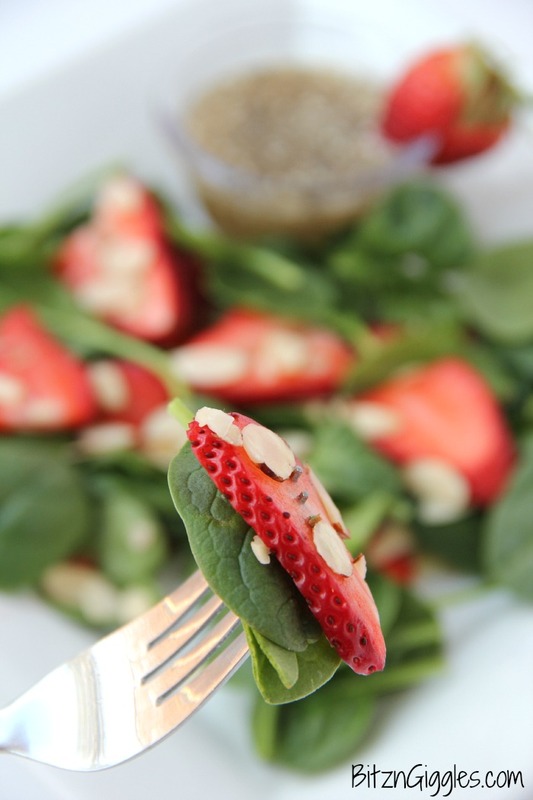 The Strawberry Spinach Salad I’m sharing today is the perfect way to welcome in spring. 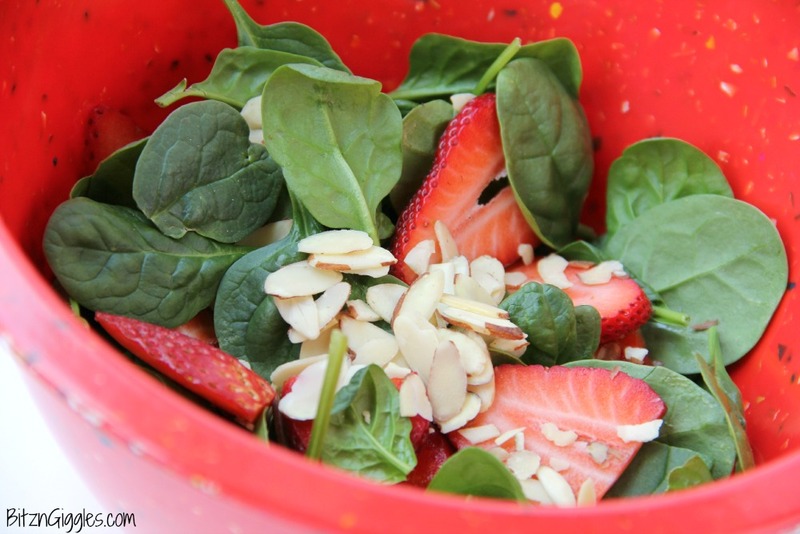 This is a delicious, sweet salad with fresh strawberries, spinach and an almond crunch. What could be better than that? Well, when you’re serving it at a baby shower, that’s what! I made this salad especially for this virtual baby shower we planned for my blogging buddy, Michelle from Healthy Recipe Ecstasy! Make sure to stop over and check out the entire menu my blogging friends and I have created to celebrate Michelle and her husband, Aladair’s, newest addition to the family – Baby Alexander! 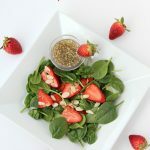 It’s really a very simple salad to throw together, and come strawberry season, you’re going to see me making this salad A LOT. My dear friend, Terrie, introduced me to this delicious salad a couple years ago. If you’ve followed along with me here on the blog, you probably know that I’m not a big fruit eater. I would take veggies over fruit any day, however, when Terrie served up this salad to me the first time, I was sold. All of the ingredients just go together perfectly, and with the red strawberries, it’s really quite beautiful. One of the other things that I love about this salad is that it’s so versatile. It’s perfect for a party or just a party of. . .one. 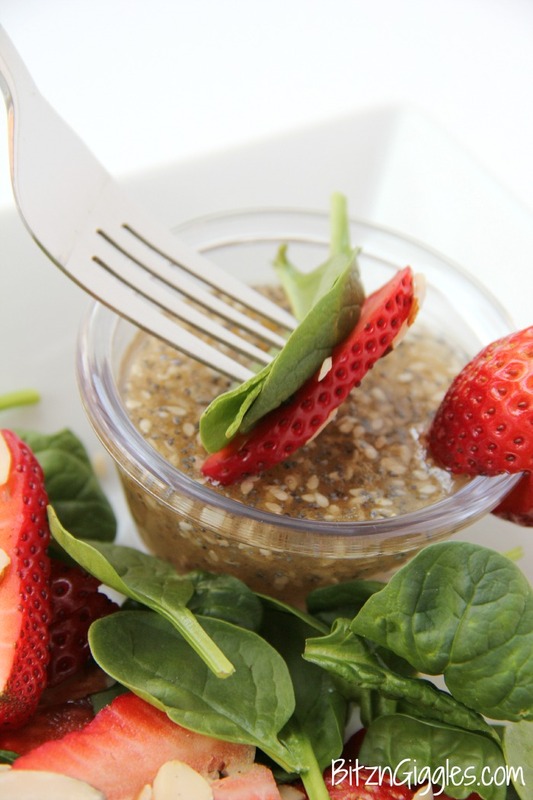 The star of the show, beyond the beautiful strawberries, is this sweet dressing. I can whip this dressing up in five minutes flat. Super. Easy. If I’m not making the salad for a group, I like to keep the dressing separate from the salad. That way I can eat this salad for a couple days. 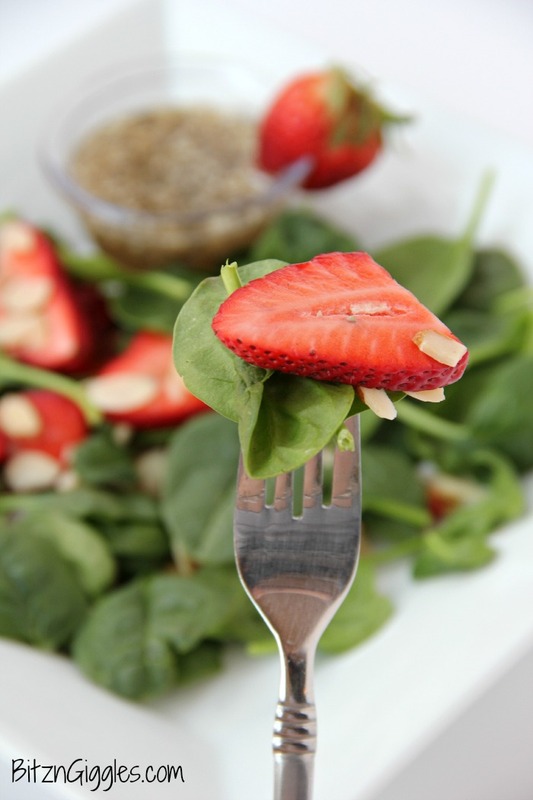 I just throw some spinach, strawberries and almonds onto my plate, pour on a little of the dressing and toss with my fork. Easy peasy. I’ve learned that once you add the dressing, there’s no going back – you’re all in. You need to eat it immediately or the spinach begins to take on a pretty wilted appearance. 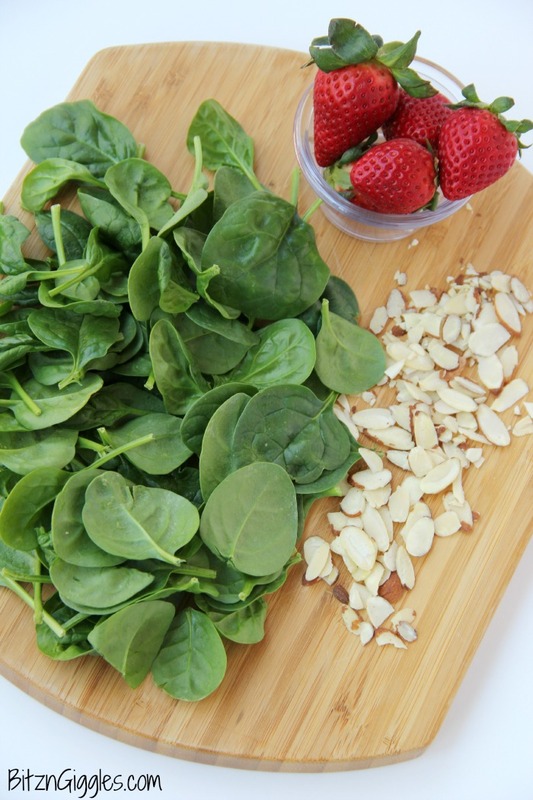 So I prefer to get a forkful of spinach, strawberries and almonds, and just dip it. Yep, I just dip it and it works out perfectly. 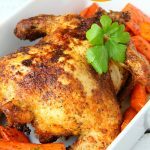 If you are making this for a group or you decide to take it to a potluck, just take the dressing separately and then toss right before serving. Before you add the dressing, make sure it’s mixed well and the sugar isn’t all sitting at the bottom of the container. I would also suggest adding the dressing a little at a time. There have been times I haven’t added all of the dressing to the salad when I’m tossing it. I just wanted to keep it lighter and maintain the freshness of the spinach leaves. Regardless of whether you’re making this for a party or just for yourself, just make it. This salad is as elegant as it is delicious. I get compliments every time I take it to a dinner party or potluck. The freshness of the fruit and spinach draws guests in, and the sweet dressing keeps them coming back for more. Happy Spring, friends! 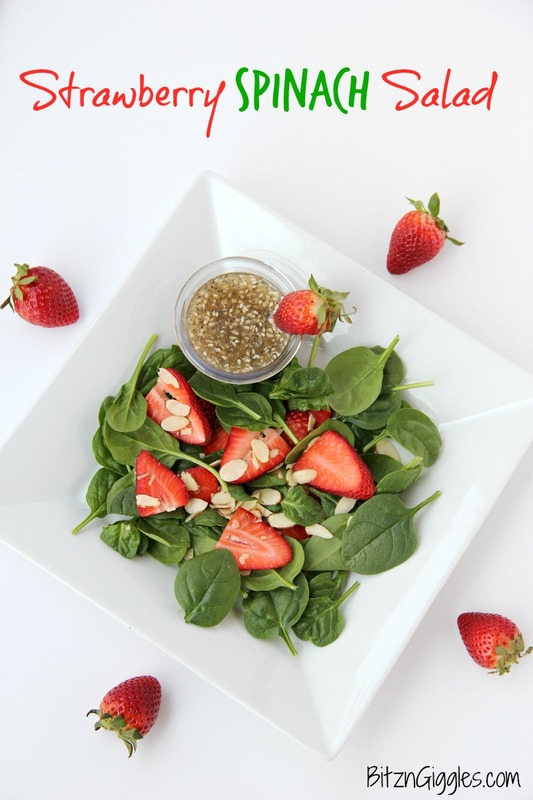 A delicious, sweet salad with fresh strawberries, spinach and an almond crunch. 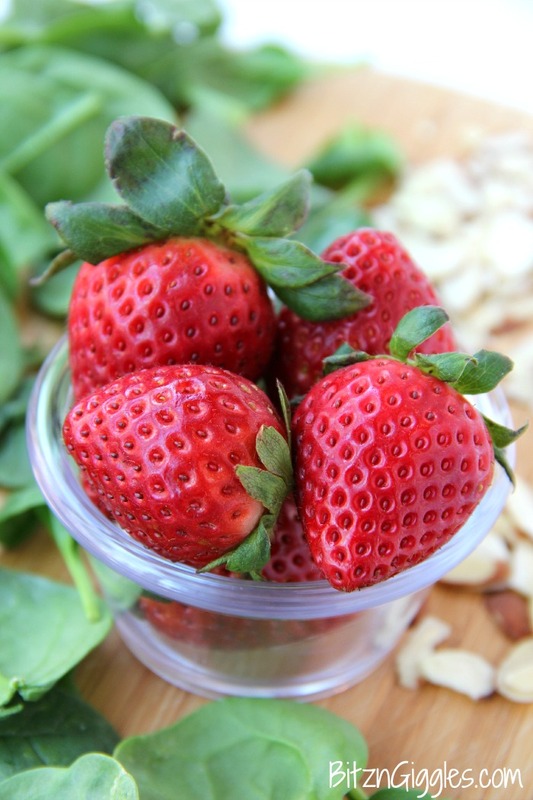 In a large bowl, toss together spinach, strawberries, and almonds. 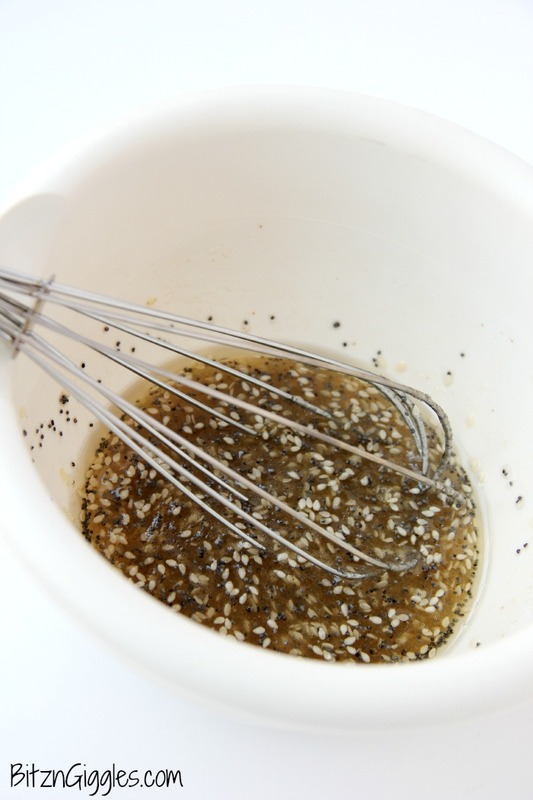 In a medium bowl, whisk together oil, vinegar, paprika, sesame seeds and poppy seeds. 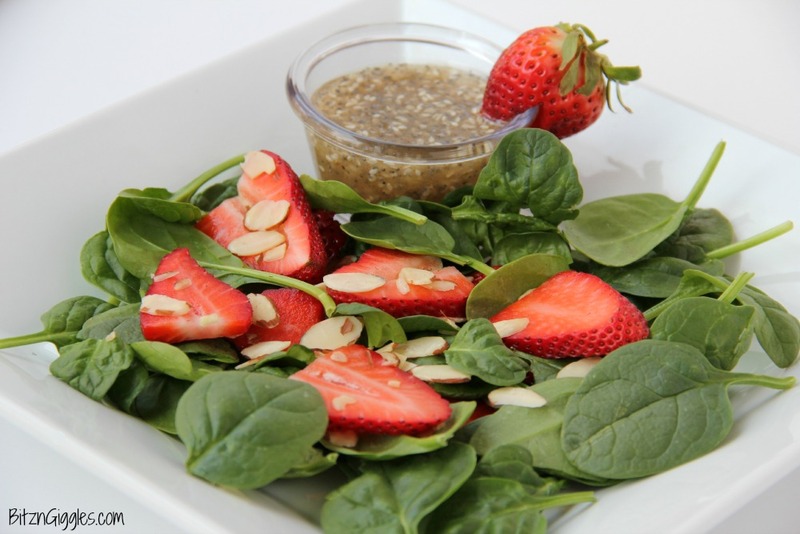 Pour the dressing over the spinach, strawberries and almonds. I was super excited about welcoming spring until it SNOWED last night! We are waking in a winter wonderland once again, and I’m not pleased! Strawberry season can’t come soon enough! Snow?! Oh goodness, don’t say the “s” word! I hope it stays far away. I’m SO ready for warmer weather! I appreciate salads throughout the year, too, Kacey, but come summer, the cool, crisp leaves are the best! I just went to the farmers market this morning to grab a few items! It is so close and I love to go there! This is one of my favorite salads to eat! Looks delicious! I’m so jealous that you’re able to go to the farmers market already! I have a few months to go before I step foot in one again. Looking forward to it though! This is such a perfect spring salad – still bold and full of color, but fresh and inviting, as well. And the dressing is what’s really calling my name. It looks fantastic! Thanks, Heather! This is one of my favorite summer salads! This salad looks perfect for spring. Its bright in color and those strawberries look amazing….yum! Thank you so much! Strawberries are great for adding a pop of color, aren’t they?! That dressing sounds so tasty! And strawberries in salads practically makes up half my diet during the spring and summer too! This sounds amazing and healthy! Thank you for linking up to Party Time and we hope to see you again next week! This looks so good. I love strawberries, so excited that its strawberry season! What a beautiful and healthy salad! Yum!! OMG Sara – those strawberries looks gorgeous. I can’t stop staring at that close up pic. What a fantastic salad for a spring shower. Thanks so much! This is one of my favourite summer salads, Sara, and now I will use our dressing recipe! I’m with you, I like to dip my spinach and ingredients into the dressing – nothing worse than wilted greens. Don’t worry about preferring your veggies over fruit. Veggies are so much better for you. 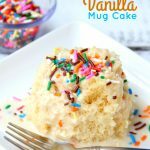 As tasty as fruit is, it has a fair amount of sugar so you don’t want to overdo it. Such pretty pics! Thanks, Robyn! I hope you do try the dressing recipe. It’s so easy to put together and it’s so yummy. I always get compliments when I make it! Now that spring is here, I’m all about strawberries! 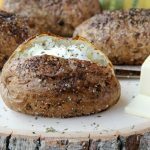 Love adding them to salads like you did here! It’s such a nice summer salad, Maggie! I hope you try it! I love these easy peasy salads that are just perfect for spring and summer. Little Alexander is a sweetie and is 2 whole months now. Beautiful photos!